Although cars had been on the roads in Berrien County, GA shortly after the turn of the century, it was not until about 1925 that Gordon V. Hardie opened the first gasoline station in Ray City, the Hardie Filling Station. Hardie’s garage was situated on the south side of Main Street just east of the tracks of the Georgia & Florida railroad and southeast of the corner of Main and Paralleled Streets. Within a few years Moses L. Giddens opened a competing garage and filling station and other Ray City automotive entrepreneurs hit the road running. In 1945, Mac McSwain went into partnership with D.L. Fletcher to open Fletch and Mac’s Garage in Ray City, GA. 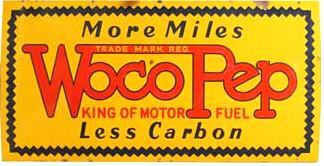 Among the products featured at the new service station were Woco Pep gasoline and Tiolene Motor Oil. Joshua Brooks “Mac” McSwain, born April 15, 1902, was a son of Mary Frances Gray and William Angus McSwain. He was born and raised near Cedar Crossing, GA in Militia District 43, Toombs County, GA. In 1910, his father was a sawyer and also an employer, but by 1920 he was back at farming. By 1940, Mac McSwain had relocated to Ray City, GA. He was married to Lelia Vaugh. The McSwains lived with Lelia’s widowed mother, in a house on Pauline Street. Mac was employed as an automobile mechanic. During the approaching week-end a new garage will be opened in Ray City according to an announcement appearing elsewhere in this issue, under the name of Fletch and Mac’s Garage. The owners and operators are D.L. 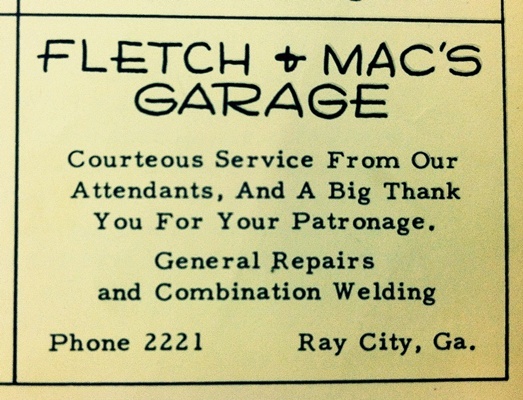 Fletcher and J.B. (Mac) Swain, both well known garage men. The managers stated that they had erected a new building to house the garage and had bought new equipment to carry on auto repair work, electric and acetylene welding. They will also handle auto accessories and Woco Pep gas and Tiolene oils. It is understood that this is a muchly needed service in the Ray City area and no doubt the concern will do a flourishing business and serve the area well. Fletch and Mac’s ad from the 1952 Beaver, the Ray City School yearbook. Daniel Lamar Fletcher was married to Ida Lou Giddens, daughter of Lyman F. Giddens, long-time mayor of Ray City. They had one child, Phyllis, before the couple eventually divorced.